I can’t let Mikey be the fish taco guy for the site. I just can’t. Not when I’ve only just begun to have an appreciation for them. So in response to Mikey’s fish taco ecstacy at Spencer Makenzie’s, I decided to take on a healthier fish taco in a quaint little mexican place in Westlake Village. I had seen this place quite a few times, but resisted going in because there are so many great mexican food options around. It wasn’t until a friend told me they had the best shrimp tacos that I really took an interest. 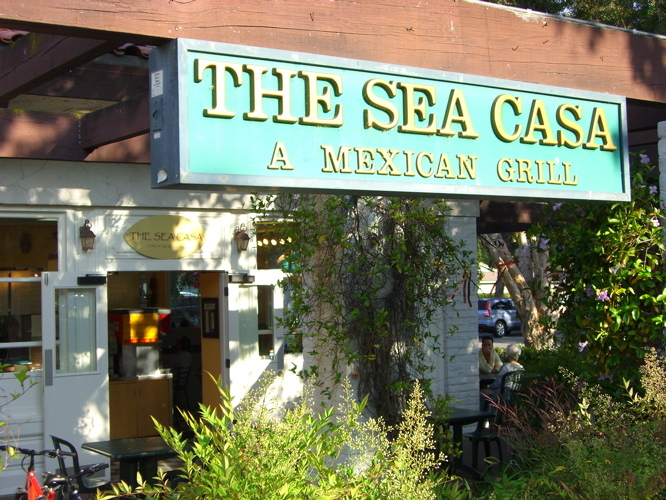 The Sea Casa is a pretty plain looking place from the outside. The inside resembles those chains like Sharky’s or Rubio’s. But it’s not a chain, and that comes through in the personality of the owner. He actually came out, brought my tacos with him, and started talking Lakers. I liked him immediately and not just because of his rad swedish accent. One of the great things about the Sea Casa is that they are very concerned with being green. They are one of the few restaurants that buys green friendly to-go containers. This is merely one of the ways that they are being environmentally aware and I hope that more restaurants take this approach. Sure it costs them a little more, but in the long run we’ll all end up benefitting. As far as the food is concerned, it’s very health conscious as well. The fish and shrimp tacos I ordered, were grilled. Plus, the sauce that came on them was fat free too. The fish taco was made with Mahi Mahi and it was not greasy at all. The tortillas were fresh and the sauce was light. Overall it was good. Not the best fish taco I’ve ever had, but probably the healthiest. The shrimp taco was amazing. The shrimp were small but they were plentiful. They were not overcooked, like most shrimp are, but instead were juicy and had a just enough of that char-grilled flavor. At about 3 dollars each, they aren’t the cheapest tacos, but they did a pretty good job filling me up. They also give you chips and salsa, which were fresh, even if they weren’t remarkable. Overall, I have to recommend this place based on the shrimp taco alone. I also think what they are doing for the environment and the way they make mexican food more healthy are big points in their favor. 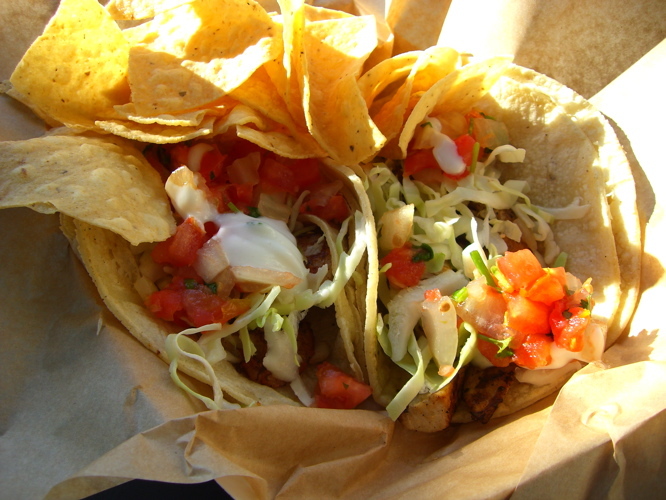 So, go there and eat some fish tacos, minus the guilt. 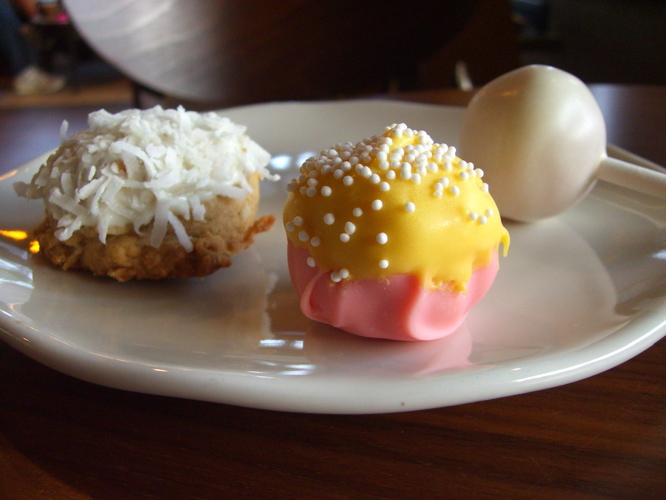 The second part of this post, the dessert, comes courtesy of our favorite baker, Amy. Some of you may have seen our original post on Amy’s greatness. She is in the process of opening her own bakery, called Stolen Sweets. In the meantime, she’s using me and a handful of other people as her own personal guinea pigs. Tonight, I was introduced to the Cake Pop, which is basically cake on a stick. Except it has a moistness like no cake I’ve ever eaten. Amy told me the secret is to mix frosting with the cake and then coat it in another outer layer of frosting. I’m not gonna lie, these things would put a diabetic into a coma. But for me, who doesn’t really do the sweet stuff that often, it was perfect. Here’s a shot of the magic inside. I’m not just saying these are good so that Amy will keep feeding me. They really are amazing. With the help of her friends at Kiss My Bundt, when Stolen Sweets finally goes public, it is bound to be a success. So remember the name EatMeCalifornians, you’re getting in on the ground floor. Oh hey! Thanks again Brian. 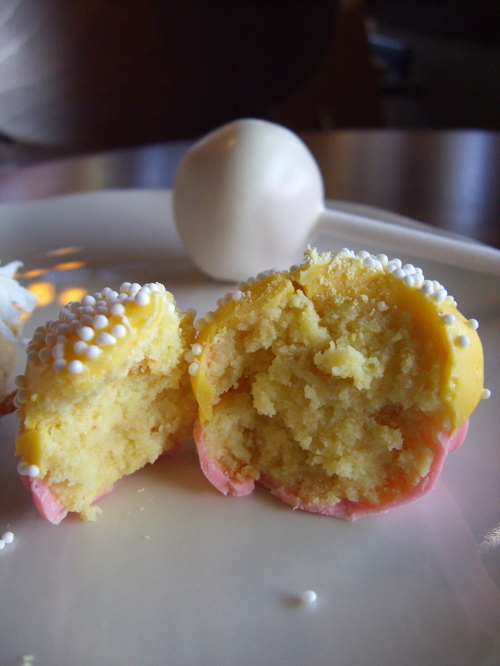 Those Cake Pops are from a cool blogger who calls herself Bakerella (http://www.bakerella.com). Also, the woman that has been kind enough to share her bakery advice and wisdom with me is from a L.A. bakery called Kiss My Bundt (http://www.KissMyBundt.net). Her name is Chrysta and she is awesome. The bakery you named is a total chain bakery that really doesn’t even come close to the bundts that Chrysta is making. You NEED to check out Kiss My Bundt sometime soon. Great stuff happening there. She even provided bundts for the American Idol after show! Sorry I got my bundt puns wrong. I’ve updated the post to display the correct info and I promise to check out Chrysta’s bundt shortly. hehe. My husband loves the Maliburrito there. It has fish and shrimp in it. I like that you can get whole wheat tortillas, fat free sour cream, and brown rice. Holy crap! Two thumbs even! Niiiiice. Hey Amy can a brotha get a cake pop! Brian keeps telling me all these great things your making but all I seem to get to try is his descriptions. Make him bring me a cookie or something!